Hi ho, hi ho…that weekend went by too fast, no? We had a completely exhausting weekend full of trying to sell all our junk. Who forgot to tell me how exhausting garage sales are? It was fun, but it didn’t leave room for any crafty projects or bathroom remodeling time. Now that all our leftovers are packed up in donation boxes, I have been thinking about more major donations. Every day eighteen people die while waiting on a transplant. That’s almost the whole Duggar family, insert sad face right here. There are over 97,000 people in need of one or more organs right now and 300 new transplant candidates are added to that list every month. When I was growing up I had a really close friend whose mom was in need of kidneys, we collected soda tabs to raise money and I said a prayer for her every night. I often sit and imagine all those families and all those prayers that could be answered just by signing up to donate organs. I have had the organ donor box checked on my license since I was sixteen, thanks in part to watching everything my friend had to go through. There is no age limit on who can donate, and I always figure that there is no reason for two lives to be lost. 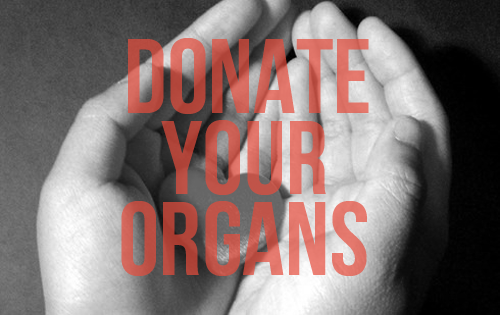 In fact your organs could save multiple lives…if that isn’t giving you a warm fuzzy feeling I don’t know what would. Sometimes it is not enough to just check that box though, you should let your family know that you wish to donate your organs too. Then there is no doubt should anything happen. Know anyone that has received an organ donation? How do you feel about those Duggars? My blog friend Amy wrote about organ donation today too! I’m down with the Duggers AND organ donation. WOOHOO! How the heck did the garage sale go?? Were you happy with the turnout/results? It was….okay. It rained all weekend so we didn’t do as well as I had hoped. BUT we did knock our “whole-room-of-junk” down to three totes. SO I figure it was a success! People just don’t like the rain haha. Oh man what a bummer about the rain! Regardless, it was a success AND a motivator to get all of that stuff cleaned out/organized/etc. Definitely a win in my book!